32Red are a well known online casino brand and if you’re in the UK, you’ll probably have seen their rather bizarre advertisements on TV which feature farmers making gambling chips! They’ve teamed with Spin 3 and Microgaming, who are renowned for developing the best online casino software, to give their Android based customers a great gaming experience. 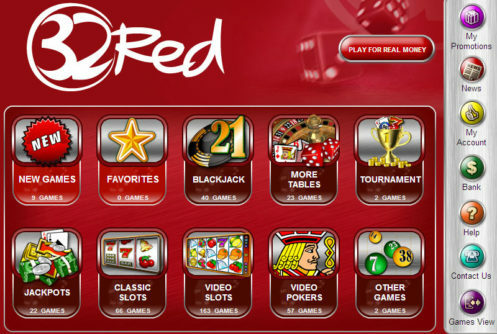 The 32Red Android casino software runs from within your browser and is designed especially for your phone/tablet. Because it’s browser based it will work with any Android device, be it the Samsung Galaxy, the HTC Sensation or the Google Nexus. As the software is designed by Microgaming’s mobile partner Spin 3, you can be sure you’re going to get a great graphical experience and they’ve done a really good job of packing the online casino experience into a package designed for small screens. The blackjack is definitely superior to some of the Playtech based casinos where the cards can be hard to see. The only complaint we have is that occasionally the load times for games are a bit on the slow side. 32Red offer a pretty wide selection of games to play on the go. The all important Roulette and Blackjack head up the mobile offering and they’re complemented by the very popular Tomb Raider 5-reel slot. They have a couple of progressive jackpot games like Major Millions which has a starting jackpot of £250,000. Alongside these, 32Red also offer Royal Derby which is a virtual horse racing game as well as their video poker game Jacks or Better, Bingo Bonanza, and a few other video slot games like Mermaids Millions and Thunderstruck. Overall, 32Red have one of the better selections of games for the Android casino market and they add to the list quite regularly. 32Red offers you the opportunity to sign up from within your phone’s browser so creating an account is much easier than sites where you have to sign up from your PC. Once you’ve registered an account, you can also deposit from within the app. You can do so using Credit/Debit Cards, Ukash, Neteller and Entropay. Players on Vodafone in the UK can also use Vodafone’s Direct Billing Service to deposit at the 32Red Android Casino. When you sign up and deposit, you’ll be eligible for an instant 100% match bonus up to £50. The casino credit your account automatically when you deposit. 32Red are a big name in online gaming and come highly recommended casino site. If you sign up there you can also play the full range of games on your PC as well as bingo, poker and do some sports betting if that floats your boat. As a listed company, you can be sure they’re operating to strict security and fairness standards and that your money is safe with them.